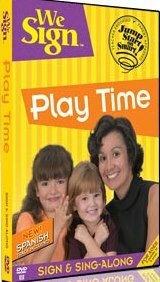 Create your own special signing times with Play Time songs that feature American Sign Language, ASL, for all hearing babies, toddlers and preschoolers. This DVD is ideal for parents and teachers to support signing instruction, language development and vocabulary growth with young children. This product features American Sign Language, ASL, a Spanish language track, subtitles, a song jukebox, We Sign Kids track for sign and sign-along fun, closed captioning and repeat play.